Some things go together, like snowballs and mittens, or hot chocolate and marshmallows. They’re just a natural fit. For us it is Valorie Clifton and Wubbers. We have been honored to have this talented lady as one of our most popular instructors for Wubbers U for about a year now, and we couldn’t be more proud of her accomplishments in the beading world. How long have you been making jewelry? What inspired you to start making jewelry? I’ve been continuously making jewelry since 2009, but as a teenager I dabbled in beadwork, usually on a loom. I used to make Native American themed, beaded barrettes and bracelets. I’ve always been fascinated by vintage jewelry. Even as a young adult, I would collect old necklaces and display them all around the house. I’m fascinated by antiquity and older styles, and particularly, in my youth, I was fascinated with Native American bead work and patterns. I’m drawn to anything old, so if I happen to stumble across vintage beads, I can’t resist them. Beadwork is a challenge, and when I began in earnest to learn beadweaving, it was primarily to see if I was capable of recreating some of the older pieces I’ve seen. Tell us about your jewelry heroes, who do you admire and why do they inspire you? Oh, wow! That’s like trying to name my favorite book! I have so many heroes that I know I’ll end up missing someone by accident. 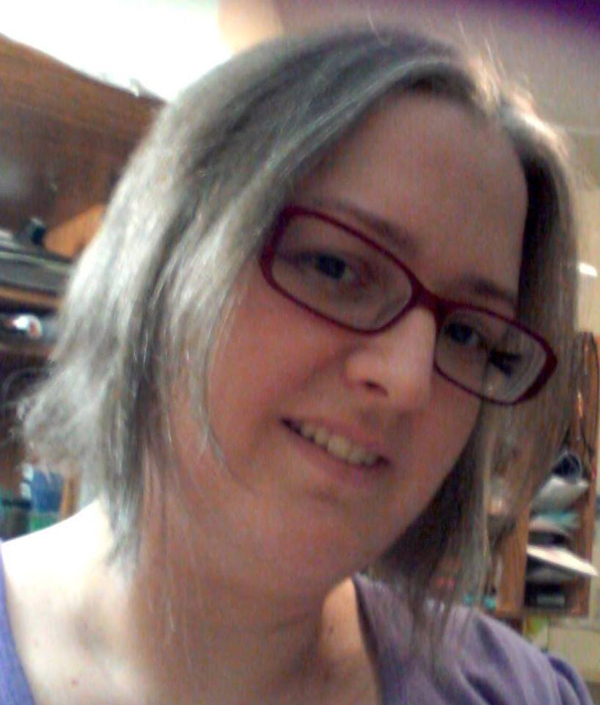 My first ever mentor was Chrisina Neit of Good Quill Hunting. When I started with bead work, I suffered from an extreme lack of confidence. Chris was Guild Master of the ArtFire Beadweavers Guild at that time, and she must have invited me several times to join, and I always declined because I was intimidated. Chris boosted my confidence and encouraged me to meet new people, get out there, show my work, and be myself. We are still great friends today and I have so much respect for her. Lexi Erickson and Kat Kramer are my heroes! They mean so much to me. Lexi has been so encouraging and inspiring. I love that she has faith in me! She lifts me up when I’m feeling self-conscious and she is always there to help me. I love her “assignments” that really get my creative thoughts flowing. I’m so, so lucky to be able to work with her and to call her my friend. Kat Kramer is a super star! She has helped me solve so many problems! She’s my go-to mentor when I have photography issues or computer issues. She’s a genius! She’s also very encouraging. She believes in me, she believes in my work, and I’m so glad to know her. I’m a huge fan of Bill Fretz and Michael Good. Metal forming is a great love of mine, and I’ve learned so much by watching their videos using anticlastic stakes. I so love the Fretz tools and I’m slowly building my collection. Other mentors of note are Seamus McDomhnaill and Susan Waltz. Seamus shared his chainmaille tips and tricks when I was learning various weaves. He also challenged me to try different weaves and more complex projects. Susan was there when I began my foray into metalsmithing. She gave much needed advice, encouragement and support, tips and tricks, and is just an awesome person! Honestly, there are so many people I admire in the jewelry world. Some of my favorites are, without a doubt: Twyla Harbick, Kassie Shaw, Nancy Dale, Aurelio Castano, Cynthia Newcomer Daniel, Tana McLane, Holly Klein, Sam Warren, and so many more! Do you have a favorite artistic quote you can share with us? If you weren’t a jeweler, what would you be doing? My dream job would be to work in an old, musty, used book store. Hah! I’m unabashedly a book nerd. However, I’d most likely work in the tax, bookkeeping or accounting fields since that’s what I already do. I’m pretty good with jobs that require meticulous care and attention to detail. Do you listen to music in the studio, and if so, what kind? I do! I have a favorite concert DVD that I frequently play when I’m in the studio: HAARP by Muse. I also love to listen to piano classical music or video game soundtracks. I really have no single genre. My tastes vary greatly. The first piece that I can really be proud of would be my Ice Queen collar. 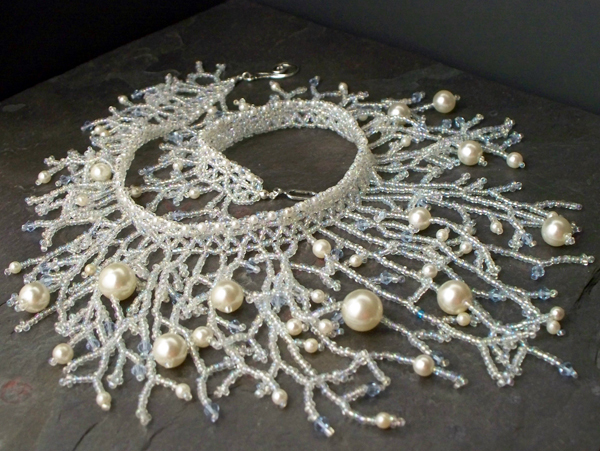 It was a beaded collar full of crystals and vintage pearls and it was white with ice blue accents. It took so long to make and was well received. It actually sold to an LA buyer to be used as part of a Winter Wonderland parade costume. Do you have a favorite tool or tools? Without a doubt, I’m a hammers and pliers girl. I also collect anvils and rusty bits of metal. I’m all about metal forming and textures. The older and crustier a piece is, the better! Can you share your favorite jewelry-making tip with us? When texturing metal on rusty items, concrete, heavily textured items, etc. I love to use a rubber mallet. I have a big, black rubber mallet that I use to bang my metal onto the textured surface. I find that I get much better impressions than if I used wood, metal or rawhide mallets. The rubber mallet forms around the divots and dings and really leaves great textures. Oh, and don’t hit your thumbs. Do you have one piece which is your favorite? Why is it your favorite? Do you have a photo to share with us? I have one piece I made for sentimental reasons, and it’s my Calcifer pendant. The stone in the pendant is flame agate, and when held up to the light, it is so gorgeous! It really looks like flames, or some say it looks like blood dropped into water. I bought it during my very first road trip with my friends; we went to my very first rock and gem show! I made the pendant to commemorate the fun we had. 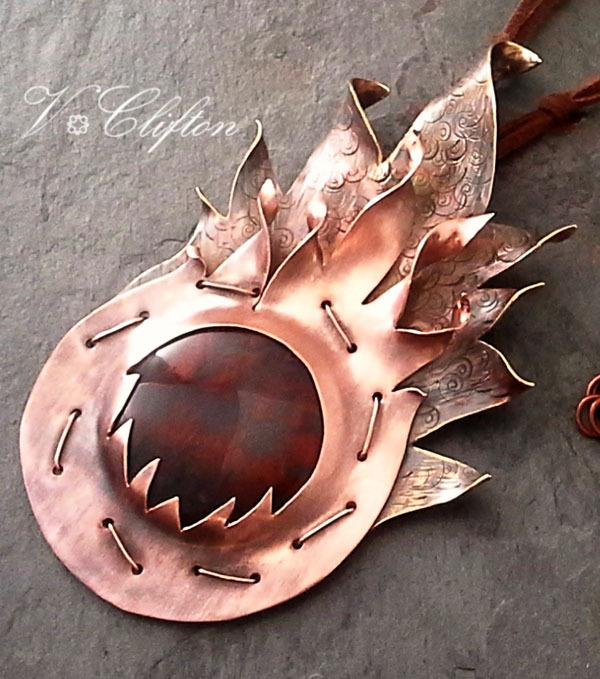 The pendant itself is rather large- it’s an art piece and is made to resemble flames- more specifically, a flame demon named Calcifer from an anime cartoon my kids and I love. I had a lot of fun curling the flames. What’s your favorite color palette? Dark bronze and gold. I use dark bronze and gold beads in so many pieces. For metals, I work in copper and brass and I always darken them. What do you do for relaxation? Is it something which inspires you? I read. Every night, I read. If I don’t read, I like to watch documentaries about ancient civilizations, where, of course, I keep my eyes peeled for interesting ancient jewelry. What’s the best piece of advice you ever received from your mentor? I think the best advice I’ve been given is the hardest advice to take: to believe in myself. Confidence is something I work on all the time. Is that the same advice you would pass on to your student? Yes, I think so. I think confidence is something we all need help with. What gives you the greatest joy in making jewelry? Metamorphosis. To be able to take a flat, plain sheet of metal and form it into something extraordinary, or to take a handful of beads and turn them into an art piece. The metamorphosis of raw materials into art is something that gives me great joy. Got any funny jewelry stories to share with us? I probably do, but I honestly can’t think of anything now. Throughout history, jewelry has been assigned a status, for example, it shows wealth, political power, employment, marriage status, spirituality power, etc. Do you feel your jewelry has any type of symbolism? Many of my pieces are created with a story in mind or for a particular individual. Sentimentality plays a large role in my work. Several of my pieces are geared toward mothers: birthstone jewelry, mothers or grandmothers jewelry, and custom color pieces such as those featuring school colors or team colors. I try to design pieces that will look great in a variety of colors so people can customize their pieces to tell their own stories. What’s in the future for you? Would you mind sharing a few of your goals? I love to teach. I currently teach in two local venues and I would like to be able to teach more frequently. I’m not really interested in travel for now, but I’d love to hold more classes each month. I love the interaction with my students. There’s nothing more gratifying than to have someone “get it” when I’m showing them how to make something. I also encourage my students to use what they’ve learned and to branch out with designs. I’m so proud of my ladies! I also plan to design more pieces, write more tutorials and build my client base. ‹ It’s the Holiday Season! Thank you so much, Shelley! I enjoy what I do so much that I just keep going, even when my confidence fails me. I’ve learned that someone, somewhere will like my jewelry; sometimes it just takes the “right” person to stumble upon a piece.